​Des Plaines Park District​ hosted the 10th Dance Idol Competition and Convention at the Prairie Lakes Community Center, 515 E. Thacker Street, in Des Plaines from February 2-4. The event featured two full days of competition with over 320 entries, followed by a Sunday full of convention classes for students. As part of the convention, dancers participate in a day of master class workshops where they can enhance their skills and learn new techniques. On Sunday, February 4, three Palatine company dancers earned scholarships for summer intensives with two dance companies. 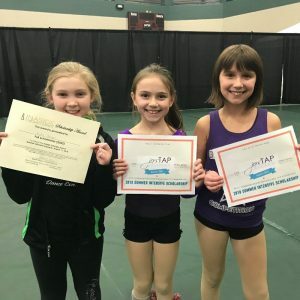 Company dancers Morgan Allord and Reese Reuter received a scholarship from jorsTAP Chicago​, and Kyra Hayes received one from Inaside Dance Chicago​. Palatine Dance Company is designed to provide an outlet for all aspiring young participants to learn and grow by performing in a variety of venues, including community events, annual recitals, and dance competitions such as Dance Idol. For more information about the Palatine Dance program, visit palatinedance.org​. Palatine Dance is a program of Palatine Park District​.